This is a project for my school’s art contest. Synopsis: A boy has grown out of his tin toy robot and is now giving him up in a garage sale along with many of his other toys. The robot’s otherwise blank face will be stained with a tear of oil. I’m going for a PIXAR-style, semiphotorealistic look. Right now I’m working on the background (I’m going to put something in there to block out the atmosphere, of course). C&C are welcome! Just for the record: Everything visible in this project was created by me, including all photographic textures. I like the concept, looking forward to progress. 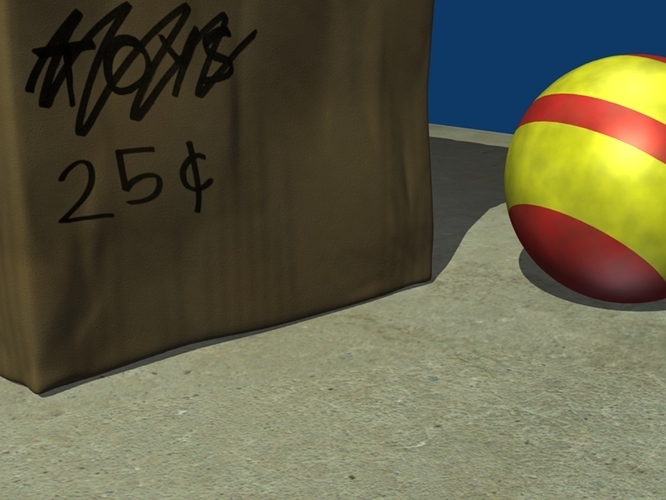 You may want to soften the shadow from the box, and use a photographic dirt map on the ball instead of procedurals. Also, I think the extremely dark box face could benefit from Yafray GI. If not, add another lamp to make it brighter. Thanks! Do you mean that the box is not illuminated well enough? If so, it might look that way, but it’s just a dark color. I do plan on putting a photographic texture on the ball (I need to find something other than the walls of the house that I can smudge my shoe on, or perhaps find something that’s already smudged) :D. I actually tried softening the shadows earlier, but the light seemed to change direction (I just changed my lamp from sun to spot), so I just left it like that for now. Edit: by the way, I’m rendering with Blender Internal.